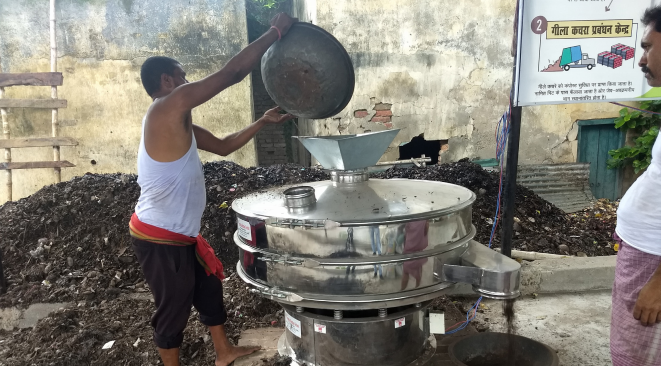 Muzaffarpur: Bihar’s first solid waste processing site to convert organic waste into compost fertiliser was inaugurated here today by Urban Development and Housing Minister Suresh Kumar Sharma. “This is an important milestone for Muzaffarpur. It is the first city in Bihar to setup a fully functional waste processing site and the only city in the whole of north India to have above 70 per cent waste segregation at source,” deputy director general, CSE Chandra Bhushan said. Almost two years into the programme, Muzaffarpur is now amongst the cleanest cities in Bihar. About 70 volunteers have been moving door to door to educate residents on segregation of waste into wet, dry and domestic hazardous waste. “We are making money out of waste. So far, we have sold two tonnes of compost. Once all processing centres are operational, we can produce 25 tonnes of compost every day which will be sold to farmers and residents,” added Dubey. The Swachhata Swasthya Samridhi programme, launched in the city in December 2016 by the Muzaffarpur Municipal Corporation (MMC) in association with the Centre for Science and Environment (CSE) and ITC Ltd, has focused on making the city a model in solid waste management. Nitish Kumar’s JD-U shedding its ‘secular image’ in BJP company?